This is a revisit of sorts to a photo taken in Alabama just outside of Madison where my grandmother lives. This steeple was really the diving reason for the trip as it shares a pretty striking resemblance to the Saturn 5 rocket which is at NASA not too far from here. Also neat about this church is the faux mosaic painting on the facade of the sanctuary which has clearly seen a little wear over the years. My late Grandad was quite the handyman and always had the right tool for the job. This was the state of his garage workbench before we did a big cleanup at the house. The story behind this shot is pretty simple...I wouldn't have even gotten a single picture of this church if it weren't for a canceled flight back to New York. As my Mom was dropping me at the airport I got a call from the airlines telling me that my flight was delayed and that there was no way I would make my connection all the way back to NY so I had to wait until the AM to get another flight back home. 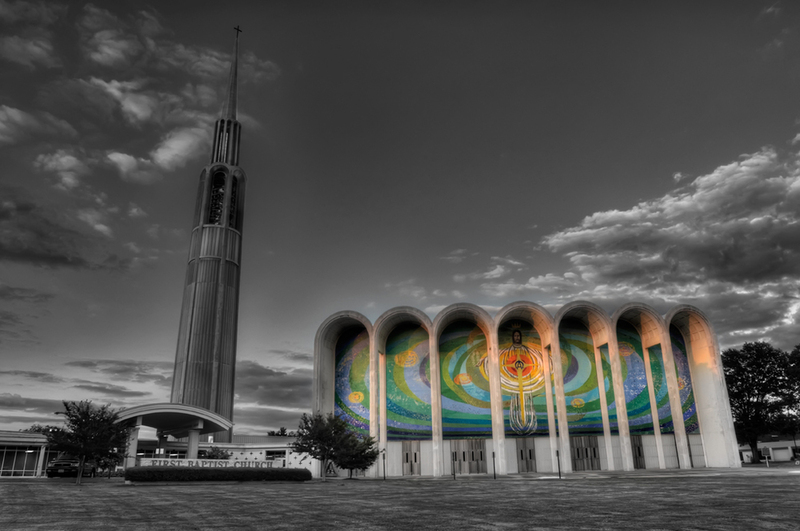 As it happened my Mom and I both had all our camera gear with us since we had just toured the Space Center taking photos and this church was on her list to photograph while we were down there. After I got off the phone with the airline we leaisurly drove back accross town and caught this church just as the sun was getting low so it worked out pretty well in our favor! The peeling paint on the facade of the church is very interesting...it almost gives the look of a mosaic. If you travel to the Space Center I recommend attending at the end of day on a Sunday to get some tripod work in. My mom and I and traveled over to get some shots about and hour before closing at the Space Center on a Sunday afternoon last month and to our surprise/pleasure there were almost no other visitors. No people to get in your shot or compete with to get the right angle on the tripod makes for a nice shooting time. I tried to get as many high quality RAW shots to play with the files later and this is the result of what I was going for...a little drama in space!